Heightened security at Trump Tower keeps the president-elect safe - but interferes with one of New York's most important activities: commerce. What's it like inside a heavily fortified building? Two private security guards wearing polo shirts and Trump buttons were having coffee inside Trump Tower one morning last week. Outside the window, police officers with semiautomatic assault weapons stood alongside Fifth Avenue. "Nothing cracks me up more than seeing a Swat team with 45 times more gear than what you'd need in Afghanistan," one of the guards said, looking out the window. His friend nodded and said, sarcastically: "Dude, you got to be ready." The officers in front of the building were part of a security patrol overseen by the US Secret Service - an elite law enforcement organisation that protects the president - in co-ordination with the New York City Police Department and other agencies. Their job is to protect Trump Tower, a 664-foot-tall building at Fifth Avenue and 56th Street - right in the middle of Manhattan. The tower is home to President-elect Trump, but the security operation is also interfering with one of New York's most important activities: shopping. Gucci is located inside Trump Tower. Prada is nearby. Next door is Tiffany & Co, the place where Audrey Hepburn's Holly Golightly once lingered. New York is the commercial capital of the nation. And President-elect Trump's neighbourhood is, as a photographer explained, "ground zero for shopping". It's a principle that Trump understands: he built a business empire in this part of New York. During the presidential campaign, he promised that he'd run the nation like a chief executive. Yet these days "business concerns" - which is how Henry Brandon, a former chief of counterterrorism at the FBI, describes them - have to be set aside, even in Trump's neighbourhood. Protecting a president - or a president-elect - is always a high-stakes drama. But Trump poses special challenges for security officials - and requires extra care. Trump used fiery rhetoric during his campaign and talked about rioting on the streets. This raised the spectre of violence around him and his entourage. Plus he lives in New York - on one of its fanciest streets. The security forces, a group that includes police officers, Trump's personal bodyguards, Secret Service agents, the FBI and others, are deployed in vast numbers around the building. They're keeping the president-elect safe - and trying to make sure protestors stay clear of the glass doors. This level of security, a Secret Service official told me, comes with a cost: "An amped-up security in New York means that businesses are going to be affected." 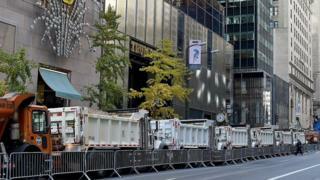 On that morning last week, police officers stood near two dump trucks that were loaded with damp sand - and parked Fifth Avenue. Traffic was stopped. It was only for a while. Still for New Yorkers, it was a shocker. "You can't close off Fifth Avenue," said Zachary Goldman, the executive director of New York University's Center on Law and Security. "That's beyond sacrilege. It's the beating heart of New York City." He's right, of course. And in fact the streets around Trump Tower have been closed only for short periods of time: when the president-elect's motorcade is leaving the neighbourhood, for example. It's an elaborate dance - and the foundation was laid long before the election. Like many wealthy New Yorkers, Trump had for years employed private security and bodyguards to protect him and his property. These men worked for Trump Organization, and many of them were former law-enforcement officers. They patrolled the building, carrying firearms, and walked up and down Fifth Avenue, checking the premises. Many of them were former law-enforcement officers. They patrolled the building, carrying firearms, and walked along Fifth Avenue. They're still doing their job: one of them rode up and down the escalators when I was there last week. During the campaign, they kept watch over Trump when he travelled. Back then they operated in a fraught atmosphere, one that was filled with the possibility of danger - from threats that targeted him and that sometimes came from him. Before the Republican National Convention in July, Trump said that he and his supporters expected to win the nomination. If not, he said during a CNN interview: "I think you'd have riots." Earlier in the year, Trump's former campaign manager, Corey Lewandowski, grabbed a female reporter and was charged with battery. The charge was later dropped. But threats of violence have continued to hang over Trump and his staff - and cause real concern for officials. For these reasons, they've added multiple layers of security. And this has led to problems for shoppers and for people who work in the area. "It stresses me out," said a Trump Tower doorman, who was wearing a bow tie and holding a dust cloth. He was talking to a woman whose silver-heeled boots clicked across a marble floor as she made her way to Starbucks. That morning they'd both had a hard time getting to work because of the security that surrounded the building. She complained about the operation - and said that she wished the protestors would leave Trump Tower alone. "It's a democracy," she said, adding: "He won fair and square." True enough. But it's New York: she and others are going to express their opinions loudly, whether about shopping, security detail - or a new president.